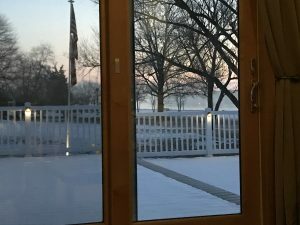 Jan 16, 2019 – I need to Fly this afternoon! I am looking for a way to drop my airplane off in Lancaster on the 27th or 28th of January. If anyone is available to offer a short flight home from KLNS to KILG I’d appreciate it. Not expecting success in this search, but it never hurts to ask. It is very cold out there – in the low 20’s; 21 to be exact. I won’t start my engines when it’s below 20 degrees at times when I’m not breaking in a new cylinder, so I’m definitely not going to do that when I am. The temperature is supposed to get up into the 30’s by noon, so I may move the airplane into the sun and fly down to Williamsburg again early afternoon. We’ll see. Then again, it may be a moot point. 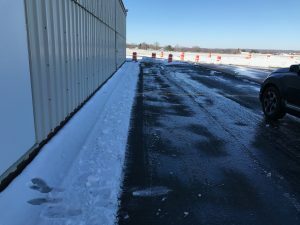 I see that my hangar does not get enough sun exposure to melt the snow and dry the pavement. I have a great view for hanging out at the hangar when it’s nice, but winter ops will have some challenges. The moisture on the clear area is a problem as well. that is melted snow that has refrozen once the area became shaded. Even if I clear all the snow, my power tow will slip when I try to pull the airplane out. Further complicating that is a slight uphill grade coming out of the hangar. I must be careful not to have the airplane slipping sideways back into the hangar and contacting a wing. I’m going over today in the hopes of flying, but I may not be able to. I purchased two Twin Hornet pre-heaters for the nacelles, and one for the cabin to allow me to fly more in the cold. Talking with the designers, I decided to give this approach a try and will document what I find. Those units should get here about the same time the incoming storm does. I’m hoping that new storm is ALL RAIN for KILG and washes the non-sense away. When it clears, I’ll have pre-heat running and be waiting for my next day off to go fly. I am due for an IFR cert that will be done up in Lancaster (KLNS). I need a ride LNS to ILG on the 27th or 28th if anyone can help me with that. If I’m off and the weather is ok and the hangar is clear, I’ll fly up on the 28th and sit there all day if I need to. I had planned to use Dale and JoAnne at KILG for my IFR Cert and Aspen update, but just found out they aren’t an Aspen dealer any longer. Now I’m having all the work done at Lancaster Avionics so it’s one stop shopping. I’ll looking into upgrading to Synthetic vision on my PFD while it’s there, and also see about the new higher resolution display. Engine Instruments: I mentioned I wanted to improve my engine monitoring, and the first estimate to do that came in at $40,000. For that price I can buy a new engine, so that isn’t going to happen. I’ll keep looking for options, including spending the money to make what I have more accurate. Right now I’m not sure if the readings are true or not, particularly EGT and Fuel Flow. Longing to fly: It looks very cold out my window as I write this. There is a frosty mist hanging over the C&D canal this morning that is thickening as the sun comes up. I really want to fly, but I may just have to be patient and wait until the hangar is safe to exit and my pre-heaters get here. We’ll see what today brings. The weather itself, other than being cold, is excellent for flying. Fly Safe My Friends! Life is good and far too short not to improve your airplane.